At the end of Disney's Boardwalk. 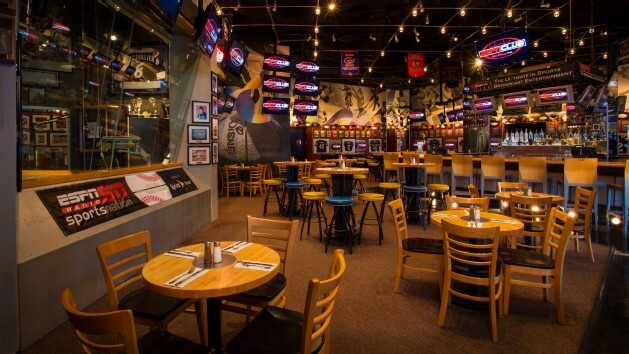 ESPN Club at Disney's Boardwalk is a premium sports bar, restaurant, and entertainment venue. The restaurant is 13,000 square feet and boasts 100 television monitors with up to 30 different programs to choose from. There are even viewing screens in the bathroom so you won't miss a second of any sports game. Football, soccer, hockey, baseball, college sports, basketball, golf, the Olympics - nearly every major sporting event, bowl game, sports commentator show, and championship match can be watched at the ESPN Club. Their full lunch and dinner menu includes American ball park food like burgers, hot dogs, and sandwiches, as well as premium options like steak. Try their PB & J Burger with smoked bacon, creamy peanut butter, jelly, and jalapeños on a toasted butter bun, a Philly Cheesesteak, or their barbeque Tailgate Pulled Pork. All your favorite gameday appetizers are served including loaded nachos, fries, chili, lobster bites, and chicken nuggets. For dessert, satisfy your sweet craving with Warm Bourbon-Pecan Brownies or The Ultimate Chocolate Fudge Indulgence. ESPN Club also has a kid's menu with healthy, tasty options for children. The bar at ESPN has alcoholic and non-alcoholic beverages. For beer, guests will find domestics and imports, bottled and draft. ESPN Club also serves local and international craft beers. Guests will find a variety of mixed cocktails using top-shelf liquors like Patron, as well as red and white wines. You'll never have to go without drinks while watching a game with so many brews and concoctions to choose from. Besides their abundance of TV screens and sports memorabilia, ESPN Club also has arcade games and shopping. A basketball court-like compound filled with sports video games for all ages. The gift shop has authentic ESPN merchandise. Reservations are recommended, especially for a big game, as the ESPN Club is a popular sports-viewing venue. For booking, please check availability online or call (407) WDW-DINE or (407) 939-3463 up to 180 days prior to your visit. VIP seating is available with the ESPN Club VIP Premium Club Seats. VIP seating features first class dining and drinks with reserved seating. ESPN Club VIP Premium Club Seats are available for $50 per adult and $25 per child, and include all food and beverage orders up to those amounts; additional charges will apply for orders exceeding the cost of each individual Guest’s admission. Tax and gratuity are not included. ESPN Club is located at the end of Disney's Boardwalk.